Once an old man was planting a seedling of an almond tree beside a road. A young boy came by and asked him, “Old man, why are you planting that seedling? It would take many years before that seedling might grow into a tree and produce almonds. No offense, but you might not even be around what that might happen”. The old man looked up at the boy and said to him, “When I was a boy, I ate almonds, because someone had planted an almond tree. I am planting this tree so that members of the next generation – maybe even you yourself – might also have almonds to eat”. The boy replied, “Oh. Thank you!”, and he continued on his way home. Children wandering off into their own thoughts. Children wandering around the classroom. Staying with one activity, concentrating on it, for only a brief time. Restless. Easily distracted – even sometimes seemingly seeking distractions from the project at hand. Children fighting with others. Not playing together cooperatively. Inflexible, demanding, impatient, wanting things instantly. Unskilled in the sharing, the give-and-take, and the taking-of-turns needed for successful playing and socialising. Children who seem to be too internally rushed to think clearly, logically, and systematically – and who are often unable to absorb and retain, and to creatively apply, information and patterns. Children who do not connect and bond very strongly with their peers and teachers. Children who behave in self-centered and obstinate ways. However, put them in front of a TV, and they sit, entranced, for hours. If permitted to play games on electronic devices, they will do so endlessly. These are the conditions of a growing number of children around the world today. More and more children are being diagnosed with conditions such as Attention Deficit Hyperactivity Disorder (ADHD), Autism, and Dyslexia. One in ten children has been diagnosed with ADHD in the USA (Schwarz 2013). Even more children seem to have mild cases of one or more of these conditions. The author is Director, World Storytelling Institute. 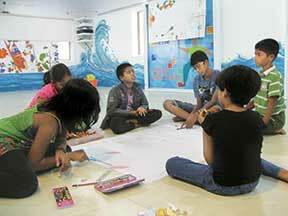 He co-leads the “Therapeutic Uses of Storytelling” component of the Expressive Arts Therapy Course in Chennai. He can be reached at eric@storytellinginstitute.org.